Hoy es Domingo with Malena Fuentes is a show that focuses on the power of the Spanish voices in our community. 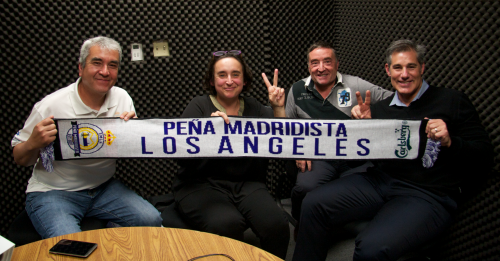 On this episode Malena talks with Stewart J. Wolfenson, who is the president of La Peña Madridista. The Official Real Madrid L.A. Supporters Club of Southern California. He is joined by Leo Molina, who is the Club’s executive advisor, and Fernando de Marcos. Fernando says he is a avid Real Madrid fan. They all discuss soccer, and their passion for building a local community. They share their interest in supporting L.A. based charities, while Stewart and Leo tell a few emotional anecdotes They also mentioned that the best way to enjoy Real Madrid games in Los Angeles is to join the Club.